91 Pts - WA - The palate is medium-bodied with supple tannin, more red than black fruit with raspberry preserve and cranberry leaf, a touch of bergamot towards the finish. The 2013 Seven Flags Pinot Noir is the seventh vintage and comes from the oldest vines from 113 Dijon clone, from the top left hand corner of the 4.5-hectare vineyard, and this represents a barrel selection. It has a refined, laid back bouquet with a pleasing earthiness, the 50% whole bunch lending freshness here. The palate is medium-bodied with supple tannin, more red than black fruit with raspberry preserve and cranberry leaf, a touch of bergamot towards the finish. Perhaps not as long term as other vintages, but still just a delicious Pinot Noir whose easy-drinking qualities are a virtue. Currently there are 18.5 hectares planted to Pinot noir on the estate, which equates to 22.8% of the total plantings. Clones include 667, 777, 113, 115 and BK5. The first vines were planted in 1989 and the youngest blocks in 2004. Vines range in age from 8 to 25 years. The soil is predominantly decomposed Bokkeveld Shale with underlying clay layers of varying depths. Vine orientation is North/South on North east and South facing slopes and North west/South east on the South facing slopes. Height above sea level ranges from 280 to 400 meters. Some vineyard blocks are superlative to others and it is these blocks that are earmarked for the Seven Flags Pinot noir each year. 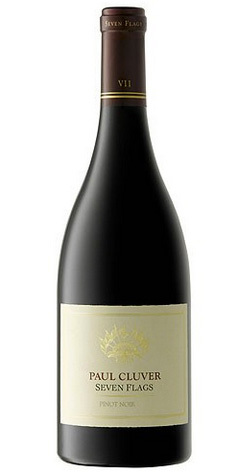 The approach to winemaking follows that of the Paul Cluver Pinot noir initially. Only Burgundian clone 113 is used. Extensive individual berry sorting was done by hand prior to crushing. This was followed by cold maceration at 12°- 14° Celsius for 4-5 days. The fermentation was allowed to start naturally before inoculating with selected Burgundian yeast. During the fermentation, the skin cap was punched through by hand 3-4 times per day or alternatively pumped over. After fermentation, the wine is racked to barrel for malolactic fermentation and remains on the fine lees for 11 months. To confirm the superiority of the vineyard sites, the ear-marked Seven Flags Pinot noir barrels are tasted blind in conjunction with all the other Paul Cluver Pinot noir barrels in the cellar. The best barrels of the site are then selected and blended to form the Seven Flags Pinot noir. Total new wood component equates to 25%. This family-owned, family-run wine business is located in the cool-climate Elgin Valley, approximately 70km south-east of Cape Town. The property has been in ownership of the Cluver Family since 1896. Recognised as pioneers of wine in the area, the focus is on producing elegant wines that are expressive of the terroir. The wine business forms part of larger holistic farming business called ‘De Rust Estate'. In addition to the vineyards and cellar, there are apple and pear orchards, a Hereford stud and eco-tourism activities, including amphitheatre concerts, on the farm. This 2000+ hectare estate forms part of the UNESCO world heritage site, the Kogelberg Biosphere. Half of the estate has been set aside for conservation into perpetuity.